[Monday, August 2, 2010] Special Aerospace Services (SAS) of Boulder, Colorado, is pleased to announce that N. Wayne Hale, Jr. has joined SAS as Director of Human Spaceflight Programs. [Monday, August 2, 2010] Committee staff received several allegations about contract misconduct by the management and acquisitions staff of the Goddard Space Flight Center (GSFC). These all related to large support contracts managed out of the Center. [Monday, August 2, 2010] Astrium has signed a contract worth 055.2 million with the Vietnam Academy of Science and Technology (VAST) for the development, manufacture and launch of an Earth observation optical satellite system. [Wednesday, August 4, 2010] The ongoing collaboration between entrepreneurial space firm Ecliptic Enterprises Corporation and Space Systems/Loral (SS/L) reached a notable milestone in mid-July with final acceptance of another Ecliptic-produced onboard video system. [Saturday, August 7, 2010] NASA has issued a BAA to purchase specific data resulting from industry efforts to test and verify vehicle capabilities through demonstrations of small robotic landers. The purpose is to inform the development of future human and robotic lander vehicles. [Monday, August 9, 2010] NASA Ames Research Center is planning for the rehabilitation of Hangar One, a historic property located at Moffett Field, California. The hangar is currently undergoing environmental clean up to remove hazardous materials. [Wednesday, August 18, 2010] AVIATION WEEK has released results from its 2010 Workforce and Young Professionals/Student Study, which show that A&D companies plan to hire 15,500 professionals this year. [Wednesday, August 18, 2010] The President's Task Force on Space Industry Workforce and Economic Development today released its report to President Barack Obama with recommendations to enhance economic development strategies along Florida's Space Coast. [Friday, August 20, 2010] NASA's Kennedy Space Center in Florida will support the new Center of Excellence for Commercial Space Transportation (COE), a university-led consortium sponsored and announced Wednesday by the Federal Aviation Administration (FAA). [Friday, August 20, 2010] The purpose of the test was to validate the Dragon's parachute deployment systems and recovery operations prior to the first flight of an operational Dragon later this year. [Saturday, August 21, 2010] The FAA has selected New Mexico State University (NMSU), Las Cruces, NM, to lead a new Air Transportation Center of Excellence for Commercial Space Transportation which includes Stanford University, Palo Alto, Calif.
[Monday, August 23, 2010] The crucial pressure testing phase for NASA's pioneer Orion crew test capsule has begun inside the NASA Michoud Assembly Facility (MAF) in New Orleans, Louisiana. [Tuesday, August 24, 2010] In response to requests from Congress, NASA asked the National Research Council to undertake a decadal survey of life and physical sciences in microgravity. [Tuesday, August 24, 2010] The Florida State University will play a key role in a world-class consortium assembled by the FAA that joins academia, industry and government to address the present and future challenges of commercial space transportation. »» What Lift-off: Should Congress Design the Next Big Booster? 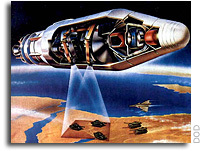 [Wednesday, August 25, 2010] Lockheed Martin today congratulated the NRO and NGA on the 50-year anniversary of the first Corona photo reconnaissance satellite image from space, which ushered in new space-based capabilities for the nation. [Wednesday, August 25, 2010] The proposed agenda for this teleconference is to continue the group's review of the Concept of Operation for Global Space Vehicle Debris Threat Management report. [Saturday, August 28, 2010] The NASTAR Center has completed the initial phase of a research effort focused on commercial human spaceflight and systems development related to emergency detection and response using an Atlas V flight profile. [Monday, August 30, 2010] There is an old saying that those who do not remember history are doomed to repeat its mistakes. However, there is an extension of this in that those who do not remember history are doomed to not repeat what was successful either.